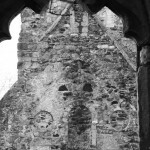 It appears that the earliest part of the church dates from the 11th century. At the time the church would have consisted of a single-cell building (a nave). All that now remains of this is the north wall and the western face (now part of the tower). The single light window in the north wall is of particular interest as the voussoir (that is the stonework surrounding the window) is made of a single piece of stone. This type of workmanship is certainly Saxo-Norman in style. circular windows were tiny, but they have widely-spayed internal jambs, the faces of which are rendered and still show the impressions of the timber shuttering used during their construction. Unlike the window in the north wall, the internal and external jambs and voussoirs of the opening are not formed using dressed stone, but rubble masonry.